 Beef cacciatore: Hearty food for a cold day (photo courtesy Touchwood Editions). 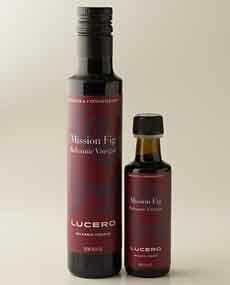 Fig is one of several flavors of Lucero fruit-infused balsamic vinegars. The cookbook “Italy: Recipes For Olive Oil & Vinegar Lovers,” from which the Beef Cacciatore recipe is excerpted (photo courtesy Touchwood Editions). 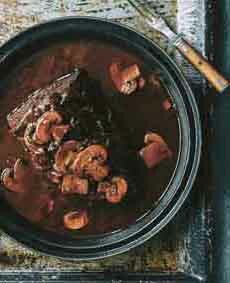 It’s freezing across 75% of the country today: a day for hearty fare like this braised rump roast (photo #1). That’s why we were glad that we already had the ingredients for this delicious roast, and didn’t have to set foot outdoors. 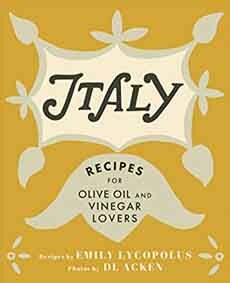 The recipe is excerpted from Italy: Recipes for Olive Oil and Vinegar Lovers, by Emily Lycopolus, photography by D.L. Acken (photo #3). It was reprinted by Lucero Olive Oil with the permission of TouchWood Editions. If you can lay your hands on some fig balsamic vinegar for the recipe (photo #2), you get even more of a rich sweetness than with plain balsamic. You also need an ovenproof, flameproof roasting pan. Most of us know cacciatore only as chicken cacciatore. When you check out the history of chicken cacciatore, below, you’ll understand why there was no beef cacciatore until the affordable beef of the 20th century and beyond. Slow cooker instructions are below. 2. CHOP the onion, slice the mushrooms, and crush the garlic cloves with the flat side of a knife, keeping the cloves whole. 3. HEAT the ovenproof, flame-proof pan over high heat on the stove top and drizzle in the olive oil. Sear the roast on all sides. Don’t rush the searing, but allow the meat to brown fully and evenly, including the ends. Remove the roast from the pan and turn the heat to medium. 4. PLACE the onion and garlic in the pan and sauté them in the beef drippings. If the pan is dry, add 1 tablespoon of olive oil. Sauté until just translucent, then add the mushrooms and cook until the mushrooms start to soften, 3–5 minutes. 5. POUR the juice from the tomatoes into the pan and stir to gently scrape off any bits from the bottom of the pan. Gently crush the tomatoes in your hands before adding them to the onion-mushroom mixture. Continue to sauté the mixture for 3–5 minutes, just until the tomato juices begin to reduce and the sauce starts to thicken. 6. REMOVE the pan from the stove. Nestle the roast into the mushroom mixture. Pour in the beef stock and the balsamic vinegar and cover tightly with a lid or foil. 7. BAKE until the internal temperature of the roast reaches 160°F, about 1-1/2 hours. Let the roast sit for 10–15 minutes before carving. Serve with a spoonful of braised mushrooms on the side. For slow cookers: Place the roast in the bowl of the cooker, cover with the mushroom mixture, and pour in the balsamic and stock as directed. Cover and cook for 6–8 hours on low. Let sit for 15 minutes before carving. Most of us are familiar with Chicken Cacciatore (cah-cha-TAW-ray), which is an Italian country dish. Beef would have been a luxury. Cacciatore means hunter, so the dish is “hunter-style” (in Italian, it’s pollo alla cacciatora). The game that the hunter brought home was braised in olive oil with garden vegetables—a light tomato sauce with garlic, herbs, onions and bell peppers, plus wild mushrooms and a bit of wine (white wine in the north, red wine in the south). The family’s chickens got the same treatment as game. Chicken cacciatore had been called a “hunter’s solace,” with poultry from the yard or purchased at the market replacing the pheasant or hare that got away. The wild mushrooms were foraged in the forest by the hunter, so he didn’t come home empty-handed. The dish has its roots in in central Italy in the Renaissance, and has many variations, both there and throughout the country. One of the more unusual is salamino cacciatore, made with a small salame. Remember, back in the day, in most homes there wasn’t a kitchen stocked with more food than could be eaten short-term, or a market down the street loaded with options. If you had it, or found it, you used it. Here’s a classic recipe for Chicken Cacciatore. Beef has never been a major food source in Italy, and even today, it’s pricey (that is, even pricier than elsewhere). That’s why “Beef Cacciatore” never joined the standard culinary repertoire. †A robust olive oil, as opposed to a delicate or medium profile, has a bold flavor, a balanced bitterness, and a peppery finish. Tuscan varietals like Frantoio and Leccino—or Tuscan blends—tend to be robust in style.